The iPod nano really is a stunning device -- beautiful in the subdued colors, light but not fly-away, small but still easy to handle. And the new larger 2" color display works great for watching video clips, especially widescreen. As I've shown it around, it's clear that even people who are not gadget lovers can't resist it! The display is bright, with a strong backlight, with 320 x 240 resolution (same as the video iPod and new iPod classic). It's still smaller than the iPod classic display (2" vs. 2.5"). The width works well with menus, as well as widescreen video - and the built-in games like Klondike solitaire. Plus the nano uses Apple's new Cover Flow interface to scroll through your music collection by the album cover artwork. The nano is easy to handle -- fitting well in your palm (2.75 x 2.06 x 0.26 in. ), solid but still light (1.74 oz. ), with the colorful anodized aluminum front and polished stainless steel back. It's just barely thick enough to fit in the audio jack, dock connector, and hold switch along the bottom. The nano is available in silver with 4 GB of flash memory for $149 (holds some 1,000 songs), or 8 GB for $199, in silver, black, blue, green, and red (2,000 songs). It syncs well with iTunes, of course (update required), for music, movies, TV shows, podcasts (audio and video), audiobooks, and games. It also syncs as a handheld organizer, with calendar, contacts, and notes. Oh, and the iPod shuffle now comes in similar colors -- silver, blue, green, purple, and red, with 1 GB of flash memory for $79. That's enough storage for some 240 songs, easily hidden in a pocket or clipped to your belt. See my updated Portable Media Players Gallery for details on these new products, with comparisons to previous generations and competitive products. Flash animations make the Web come alive -- from fun little clips, to interactive tutorials, to full-up games, and now video as well. Yet multimedia development with Flash -- now up to Adobe Flash CS3 Professional -- can be a new experience, whether you are approaching it from a background in graphics art (i.e., Adobe Photoshop and Illustrator) or from digital media (i.e., Adobe Premiere Pro and Encore DVD). First, the terminology is similar, but different -- with timelines and layers and frames, but also scenes and stages. And there's the mix of develop styles -- visual drag and drop and/or full-up programming with ActionScript. As a result, teaching Flash so it makes sense to a new user requires a delicate touch -- you need to explain this larger context and nomenclature before you can dive in to the gory details. 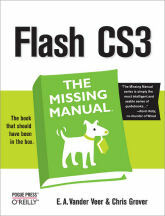 And Flash CS3: The Missing Manual by E. A. Vander Veer and Chris Grover, veteran Missing Manual authors, does the job well, living up to the well-deserved reputation of this David Pogue series. The key is in how the book gets you started. The Introduction provides a nice overview of what Flash can be used for, and the basics of making animations. Part 1 starts with a tour of the Flash application, and then dives in to a simple example of creating drawings and making simple animations of them. Without much fuss, you're working with layers and even tweening, so that this overwhelmingly complicated tool has somehow been demystified (a different book series) and now seems actually possible to work with. Part 4 then details how to publish and export your animations, but also with careful attention to testing and debugging strategies to make sure things really do work the way you expect them to. The Appendixes have tips on installing Flash and getting help and more information, and a menu-by-menu reference to the software. Like other Missing Manual books, there's no CD-ROM with the book, which reduces the cover price. Instead, the sample files used in the book are posted online for downloading. Flash video is sweeping the Web -- and you can be using it too. If you're new to Flash, you can encode your videos to Flash video to post on the Web, and embed then in your Web pages using simple video players as provided, for example, by Adobe Dreamweaver. Or if you're already a developer with Adobe Flash CS3 Professional, you can integrate videos into your Flash animations. 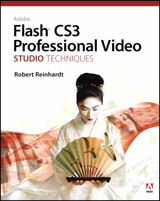 Rob Reinhardt, lead author of the Flash Bible series, shows you how in Adobe Flash CS3 Professional Video Studio Techniques, from Adobe Press. To get you started, the entire Part 1 of the book is dedicated to Working Foundations -- pre-production and shooting tips, capturing and processing video in Adobe After Effects, compression formats and parameters, and Web delivery options and formats. Almost every page also includes Tips and Notes with additional information and references. Part 2 then digs into Production Essentials, using Flash video with Dreamweaver, using the Flash Pro FLVPlayback components, encoding with Sorenson Squeeze, and then building your own Flash player. There's also a chapter on planning your bitrate budget, with an associated Excel spreadsheet (and an interactive Flash version now posted to the blog). By this point, the book is deep in ActionScript code allowing you to customize your own animations. The book includes a DVD-ROM with almost 9 GB of Flash projects, source files, and video clips. The book also cleverly uses public domain video clips from the Prelinger archives -- www.archive.org/details/prelinger -- all public domain and royalty-free for you to experiment with. Finally, Part 3 adds further Creative Explorations, including building a video index and playlist, creating an interactive talking head overlay, and tips for optimizing the video playback. The Appendices cover installing the Adobe software and third-party tools and utilities, encoding options, troubleshooting tips, and a project checklist for Flash video projects. Sennheiser continues to introduce interesting new earphone designs, in its CX series of in-ear headphones, in Classic, Street, and Style lines, and in an array of fun colors. - The Classic CX 400 features shallow ear canal adapters for wearing comfort and passive noise attenuation, and include three ear fit adapters (S/M/L), for $99. It has a short cable that's great for use with a player in the pocket or on an armband, or when used with a remote control or microphone. The package also contains a 3 foot extension cable when needed, plus a cable clip, cable winder, and carrying pouch. - The top of the line CX 500 has a wider frequency response and integrated volume control, for $129. - The CX 55 Street is designed to provide powerful low-end frequency response for street use, with bass-driven stereo sound, for $79. The posts are shaped for ergonomic ear position. - The CX 95 Style is designed to provide very balanced sound and highest possible sound resolution, for $139. It features both the ergonomic design and short cord. See the Portable Audio Accessories Gallery for details and comparisons. 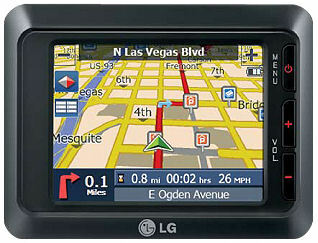 GPS has gone portable, with handheld units like the LG LN735 Portable Navigator. It's not quite pocket size at 4.3 x 3.2 x 0.7 inches and 1/3 pounds, but it's easy to carry and easy to fit in the car, even when loaded up for a trip. We tried it out for the past few months traveling the eastern seaboard, through New England, on the streets of Boston, and winding our way along the shoreline of Cape Cod. You should expect today's GPS navigators to work well -- Start up quickly (in under a minute or so), stay on track, and recompute routes quickly when needed (some 10's of seconds). It's the interface that makes these units -- both while driving, and when setting up and entering new destinations -- with live map guidance displays for the driver, plus added options for the passenger, including review of turn-by-turn directions. The LG has a good driving interface on the 3 1/2 inch touchscreen display, with options for 2D (overhead) and 3D maps (perspective), plus night mode with a darker display (there's also a brightness control in the menus). The unit speaks voice prompts for upcoming turns (in multiple languages), with options to name the road (typically quite well even for odd names), and/or the highway number. Even when we were traveling on known routes, it was still helpful to have the unit on to remind up of an upcoming highway exit, just in case we were too involved in the audio book and not paying attention to signs. The display counting down miles to the next turn also helped pace long drives. 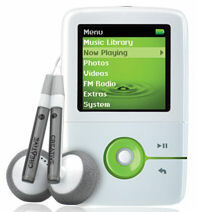 The LG also can be used as a music player (MP3, WMA) and photo viewer (JPEG, BMP), especially with an optional SD card. You can just drag and drop media files though the USB connection using Microsoft ActiveSync. LG also includes PC Portal software to install new and updated maps, back up settings, and import your own custom favorites. The LG LN735 Portable Navigator is available for around $249. There's also a less-expensive LN730 with fewer points of interest, and an enhanced LN740 with a larger 4 inch display and longer battery life (6 vs. 4 hours). See the Mobile Communications Gallery, under Mobile Navigation Systems for details and comparisons. With its acquisition of Altec Lansing, Plantronics has developed some interesting new devices combining its expertise in lightweight communications headset products with enhanced sound and music capabilities. The Plantronics .Audio digital computer headset line ranges from lightweight stereo voice headsets to DSP-enhanced and virtual surround sound hardsets with full ear cushions, featuring PC and Mac compatible USB sound card adaptors for plug-and-play digital audio. But the new idea is the Plantronics .Audio 480 Virtual Phone Booth Headset, designed as a portable computer headset especially for mobile laptop users. It strips down a headset to the essentials: a pair of stereo earbuds especially for listing to music, plus an adjustable boom microphone for VOIP calls. It's available in two versions, with analog connectors ($89) or USB, with an analog-to-USB adapter with a built-in sound card interface, especially for Macs ($109). The "Virtual Phone Booth" concept is designed for laptop users in public spaces. It's based on two elements: sound-isolating earbuds to block out external noise, and a noise-canceling microphone and wind-reduction technology to minimize external noise for callers. 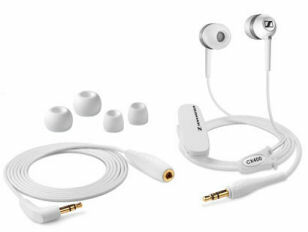 The product includes a selection of earbuds for a comfortable fit. This is especially important since there's no headband or over-ear loop -- instead the left earbud with the mic has an eartab extension that nestles in the folds of your outer ear as a stabilizer. The cord also has a thin inline controller with a mute button and volume slider, so the entire headset still collapses down easily into the included carrying case for travel. See the Portable Audio Accessories Gallery for details and related products. Got the low power blues? Is your cell phone battery indicator blinking on its last bar? Need more juice, but out of time to stop by an outlet for a pick-me-up? What you need is portable power -- batteries, plus a compatible adapter to connect to your particular device. And that's what Turbo Charge does -- and now in two models: the original single-battery version, and the new Turbo Charge Squared (TC2) with two batteries. The original Turbo Charge could keep your phone working after it ran low, and give it a boost, but it was not designed to fully recharge. The new TC2 provides more power -- hundreds of hours to help keep you going (Lithium batteries recommended). See more options for portable power in the Portable Power Accessories Gallery, under Portable Battery Chargers. TV on your PC? Even better: high-definition television on your laptop! The USB 2.0 interface is actually fast enough to handle streaming HD TV on your computer display, so you can plug in a small external USB device and be watching live TV. 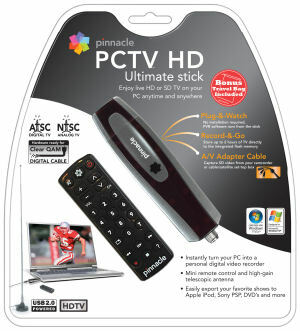 And Pinnacle has just augmented its PCTV line of USB HD tuners with an interesting new feature: the PCTV HD Ultimate Stick requires no software installation -- the included Windows TV tuner / DVR application runs directly from memory on the device. So it's a lot easier to just plug it and use it, on desktops and laptops. It's also compatible with Windows Media Center. 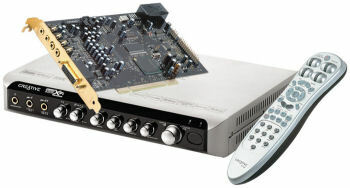 The Pinnacle PCTV HD product line includes PCI cards and USB Sticks for PCs, and the Pinnacle TV for Mac HD Stick -- and all supporting HDTV. - The base PCTV HD Stick records in MPEG-1 and MPEG-2 formats, from both analog (NTSC) and digital (ATSC) TV ($79.99). - The PCTV HD Pro Stick adds an AV adapter for capture from external analog sources, plus recording to MPEG-4, DivX, and direct-to-iPod or PSP formats ($99.99). It also includes a mini remote control. - And the new PCTV HD Ultimate Stick adds the "Plug-&-Watch" feature to run the application directly from the stick($129.99). It's also hardware-ready for Clear QAM (unencrypted digital cable TV). A few provisos: While you don't need to install the TV software application, you actually do need to install the required drivers the first time you use the hardware -- a quick operation from the memory on the device. And pushing HD video can still be a big stress on a PC, so Pinnacle recommends a Pentium 4 at 2.6 GHz or equivalent, with Windows XP or Vista. The Ultimate Stick ran great on my test Xeon quad system at 2.6 GHz -- HD TV played easily, using only some 15% of the processor. See previous article on the Pinnacle PCTV HD Pro Stick (3/2007). Want better, clearer photos without handheld shake -- but don't want to lug around a clumsy tripod? Even a mini-pod won't work well in the field, with rough ground and irregular environments. Instead, try the Joby Gorillapod, with flexible bendable legs. It's easy and fun to pose, with legs that bend and rotate 360 degrees, and stays steady with rubberized ring and foot grips. You can set it up standing on rough surfaces, or wrap and hang it to take advantage of vertical objects like trees or doors. - The Gorillapod Original is for compact digital cameras up to 9.7 ounces ($24.95) -- now available in 6 bright colors. It travels easily in your bag at under 10 inches long and 1.6 ounces. Just screw your camera into the mount, or use the slim-line camera attachment to snap in to the quick-release lock ring. - The Gorillapod SLR is for lightweight SLR cameras and camcorders up to 1.75 pounds ($44.95). - The Gorillapod SLR-ZOOM is for heavier pro cameras up to 6.5 pounds ($54.95). It includes a universal 1/4-inch tripod screw plus a 3/8-inch adapter screw. See more on tripods in my Digital Cameras Gallery under Accessories. I've found monopods tremendously useful for informal shoots -- They're much easier to collapse and carry than a full tripod, and I can just sit in the audience at an event and shoot quietly with my camcorder on a stick. It's even possible to pan and zoom a bit without being too obtrusive. However, holding the stick steady can get tiring though a long concert, and it's surprisingly difficult to ensure that you're not drifting off vertical with a small tilt. If this approach appeals to you, check out the best of both worlds -- the Trek-Tech TrekPod -- a line of monopods that you also can use as a walking stick, and then open with a set of tripod legs. Plus they include an innovative MagMount quick-release magnetic mount-demount system. The base TrekPod design includes an adjustable hiking staff with cushioned palm grip and adjustable height. The bottom section is actually three tripod legs held together with a Velcro strap -- zip off the strap and they open to a diameter of 22 inches. The original Trek-Tech TrekPod extends from 47 to 62.5 inches as a monopod, or 43 to 57.5 inches as a tripod ($139.99). The new Trek-Tech TrekPod Go! enhances the product with a collapsible design that fits in an overhead carry-on, packing into the case at 23 x 4 x 2.5 inches and 28 ounces ($199.99). The height range extends some 4 inches lower. The mounting mechanism also is upgraded to the MagMount AR/i - adding Anti-Rotation stops with 30 degree Indexing. Trek-Tech also offers the T'Pod mini tripod ($79.99) and accessories including the VersaMount clamping arm ($19.99) and WindowMount Plus pan and tilt MagConnect window mount system ($59.99). Today's multi-gigabyte USB thumb drives are a great way to move digital files between PCs -- including music and video clips. But to view those clips, you need to get back to a PC, or move up from a USB drive to a media player -- with a headphone jack for a music player, and a color display for a video player. But with today's high data capacity and high-res video, a tiny handheld screen does not provide a nice viewing experience, for your personal use, much less to share with a group -- that's what TVs are for. Within your home, you can bridge PC content to a TV with various approaches for media sharing, with media extender boxes like the Apple TV or game machines like the Microsoft Xbox. But these require yet another set-top box, and struggling with networking and connectivity issues. At the CES conference in January, SanDisk introduced an alternate approach, what was then called USBTV -- drag content onto a USB player as usual on your PC, and then carry that device to the TV to play back the content on the bigger screen (as you can now do with some iPod TV docks). 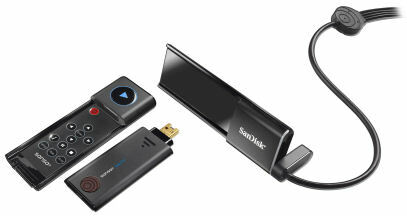 And now SanDisk has introduced its first such product, renamed the SanDisk Sansa TakeTV PC-to-TV video player. Download content to the TakeTV player on your PC, and then slide it in to the dock connected to your TV with standard AV composite or S-Video cables. Then use the built-in remote control and on-screen guide to select the stored content to play. The TakeTV supports the DivX, XVID, and MPEG-4 video formats, up to 720x576. It's available with 4 GB of flash memory for $99.99 (five hours of video), or 8 GB for $149.99 (10 hours). SanDisk also announced the public beta of its new Fanfare download service, offering both free (ad supported) and paid programming. It uses the SanDisk TrustedFlash content protection technology for flash media. Today's mobile phones are becoming music players -- you can sync songs from your PC music library, plus get the immediate gratification of downloading songs from online libraries over your wireless data connection, as with Verizon Wireless V CAST Music. 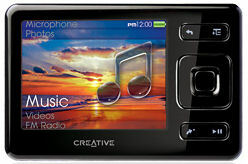 Then wireless PDAs like the Palm Treo can browse the Internet to download music clips and play Internet radio stations over the wireless data connection. Meanwhile, media players are also going wireless by adding Wi-Fi. The Microsoft Zune uses Wi-Fi to share content bewtween players, and the ARCHOS 605/705 WiFi players with big touchscreen displays have an integrated Web browser, and can access and play media from your local network. And Wi-Fi even makes sense on a mini player with a small screen. 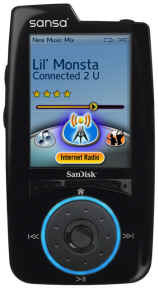 The SanDisk Sansa Connect is handheld -- but not tiny -- at around 2 x 3 1/2 inches, with a 2.2 inch color screen and usable controls. It plays music and photos (but not video), so the screen is great for navigating menus and browsing the stored media files. It also has an internal speaker to share music with friends. The Connect comes with 4 GB of internal memory for around $129, and is expandable with a microSD expansion slot. But what makes the Connect especially interesting is its built-in Wi-Fi support. You can connect to Internet radio stations to stream music from any number of channels and styles. Users with a Yahoo! ID can listen to LAUNCHcast Internet radio, browse Flickr sets and photos, and communicate with Yahoo! Messenger friends and other Sansa Connect users nearby. Users with a Yahoo! Music Unlimited To Go subscription can discover and download music, and listen to and download tracks friends have recommended. The Wi-Fi setup automatically finds available networks -- you can connect to a public hotspot, or enter the password for a protected network (but not arbitrary parameters). In testing it around New York City, it worked great in hotel hotspots, but unfortunately not in Bryant Park (it saw the signal, but could not connect, apparently because the service requires acknowledging a terms of service screen). In fact, the Connect makes a handy Wi-Fi meter, listing the signals found, open and lock, and signal strength. 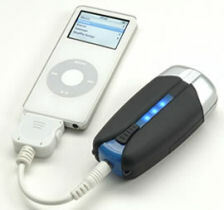 See my Portable Media Players Gallery for details on these products. 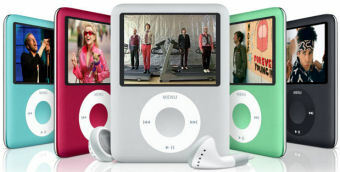 Yes, the Apple iPod players are popular and elegant (see summary post), but the line has only three models, with a limited selection of capacities and colors. If you're the type who likes lots of alternatives when you're shopping, then check out the Creative line of portable media players. If you want a small MP3 / music player beyond the iPod shuffle, the tiny Creative ZEN Stone is 2/3 ounce without a display with 1 GB for only $39 (see review post). The ZEN Stone Plus is 3/4 of an ounce with the addition of a blue OLED display, with 2 GB for $69, plus FM radio and voice recording. Or try the slightly larger ZEN Nano Plus with 1 GB for $49, also with line-in recording. Or for highly portable video playback, there's the amazingly small Creative ZEN V Plus, only 2 1/2 x 1 1/2 inches and 1.6 ounces, with 1.5 inch mini color screen -- 1 GB for $69 and up to 8 GB for $169. Then to store your entire media library, step up to disk-based players like the video iPod, with much more capacity, larger screens and therefore heftier designs. 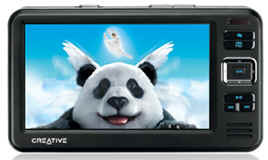 The Creative ZEN Vision has a 3.7 inch display at 8.4 ounces, and the Creative ZEN Vision W has a 4.3 inch widescreen display, with 30 GB $279, 60 GB $399. But the big screen, high capacity, built-in speaker, and removable battery add bulk -- the ZEN Vision W measures 5 1/4 x 3 x 1 inches and weighs 10 1/2 ounces. Which brings us to the new Creative ZEN (yes, just "ZEN") -- a best-of-both-worlds option like the new iPod nano (see earlier post), with video playback on a somewhat larger screen, but still small and light since it's based on flash memory. The ZEN front is sized like a credit card with a 2.5 inch screen, at 2.2 x 3.3 x 0.44 inches, and 2.3 ounces. It's available with 4 GB for $129, 8 GB for $199, and 16 GB for $249. The ZEN supports multiple media formats -- audio (MP3, WMA, WAV, Audible audio and AAC4), video (WMV9, MPEG4-SP3, DivX 4/5, XviD, MJPEG), and photos (JPEG). Beyond playback, it has FM radio, voice recording, and an expansion SD card slot. Plus it can sync organizer data with Microsoft Outlook. The Li-ion battery provides up to 25 hours of audio playtime, or 5 hours of video. See my Portable Media Players Gallery for details on these and similar products. Bluetooth is not just for wireless audio between your mobile phone and in-ear headset. It is being built in more and different kinds of devices, and you also can use standard peripherals to add wireless capability to existing components. There's music packed up in your phone and MP3 player, so now you can share from your phone though Bluetooth -- and play through your PC speakers or even your hi-fi system. Or broadcast in the other direction, from your MP3 player or PC media library to listen on your phone headset. 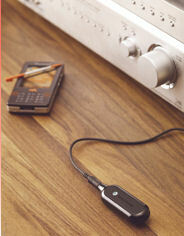 The Sony Ericsson MBR-100 Bluetooth Music Receiver receives music from your phone, so you can hear it though your hi-fi system ($79). The Sony TMR-BT10 Bluetooth transmitter module sends stereo audio from a digital music player to a Bluetooth-equipped headset, speaker system or car stereo ($79 / $53). The Sony HWS-BTA2W Bluetooth transmitter/receiver is dual-use ($79). As a transmitter, it streams stereo audio from devices with standard stereo mini plugs, such as cell phones with adapters, MP3 players, PCs, and home stereo systems. As a receiver, it converts almost any speaker system into a stereo Bluetooth speaker from the line out jack. 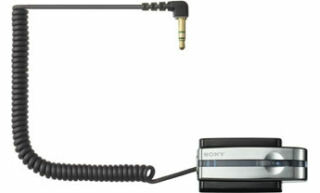 See the Portable Audio Accessories Gallery under Wireless Transmitter / Receivers for details and related products. In these days of wireless communications, why are we still physically connecting digital cameras to access our photos? Tired of finding and connecting the proper USB cable, or chasing down a compatible memory card reader? Your problems are solved, with the Eye-Fi Wi-Fi-enabled SD memory card ($99 for 2 GB). Just configure it on your PC or Mac to connect to your home network, and then plug it into your camera. Then whenever you store images on the card, and it's in range of your network, it will transfer the photos to a folder on your computer. You just need to be running the Eye-Fi Manager software on your PC or Mac -- which then also can upload your images to a website. UPDATE: The Eye-Fi card also can be set up to communicate directly over Wi-Fi to the Internet and the Eye-Fi server, which can then dispatch your photos to a variety of photo sharing sites. General FTP transfer is not supported (yet). We're entranced by video -- sucked in to TV shows and movies and now short clips on YouTube -- but we're also seeing a flowing of music and audio -- with MP3 players and mobile phones and libraries of albums on our computers. - High-performance surround-sound boards to deliver blow-out entertainment and gaming, with build-in sound mixing and enhancement. Just what you needed to turn your PC into a high-def entertainment center. - Noise-canceling headphones to isolate your ears from outside sounds with the padded earpieces, and then apply active noise cancellation technology to eliminate extraneous background noise. - Bluetooth headphones (including noise canceling) to enjoy your music wirelessly. - Bluetooth transmitter/receivers to share your music between portable devices, computers, and even hi-fi systems. 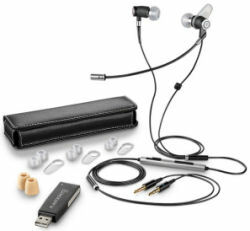 See my Portable Audio Accessories Gallery for details on audio headphones and accessories. Entries posted to Manifest Tech Blog in October 2007, listed from oldest to newest.